The Phillies will "take it slow" with Altherr (foot) at the beginning of spring training, Todd Zolecki of MLB.com reports. Altherr finished the 2018 campaign on the shelf due to a right foot injury that ultimately kept him immobilized for six weeks. 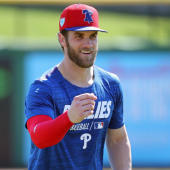 While the outfielder is currently taking batting practice in the cage, he still hasn't built up to running and cutting, putting him slightly behind others as the start of camp approaches. Barring any setbacks, Altherr is still expected to be ready for the start of the season. He projects as outfield depth in 2019 after hitting just .181/.295/.333 across 105 games last season.